"PRO" both switch & wireless operated. Hides 2 registration plates (front & rear). 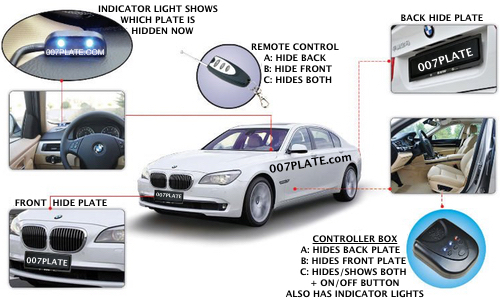 Comes with an indicator LED light to remind you when 1 or both plates are hidden. Also includes a cigarette lighter plug for easy power supply (can be hard wired to battery too). 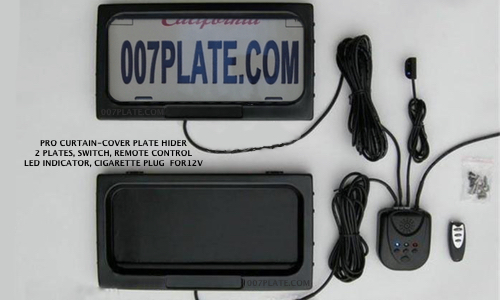 "PRO" curtain-cover kit comes with 2 hide plate gadget so you can hide both front & rear license plate. Has a central brain unit which installs inside your vehicle. Central brain unit has buttons on it which can operate 2 gadgets (front plate AND rear plate). It also comes with a tiny keychain remote control so you can operate the gadget from up to 150ft away. Comes with an LED light which lights up anytime your plate is in HIDE position, very useful so you don't forget that your plate is hidden. And comes with a cigarette lighter plug for easy 12v power, can easily be hard wired to battery too. "PRO" gadget - everything is included.